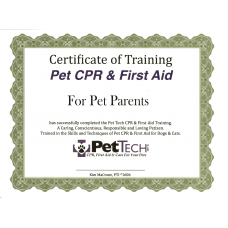 Our trainings have helped save the lives of thousands of pets that have been in emergency situations with their guardian or Pet Care Professional. It is so incredibly rewarding and heart-warming to receive a card or letter from a pet-parent that saved their pet's life using the skills and techniques they learned in your class. Unknown is the countless preventable accidents that can be prevented by the owner or Pet Care Professional being trained and now more aware by preventing the incident from ever happening in the first place. We invite you to check out our PetSaver™ Training and our Pet Tech™ Instructor (PTI) Training to see which is right for you. Our PetSaver™ Training is a one-day course designed for pet owners as well as Pet Care Professionals. Our Pet Tech™ Instructor (PTI) Training is a three-day course that will train you to teach the PetSaver™ course to pet owners andPet Care Professionals in your area. 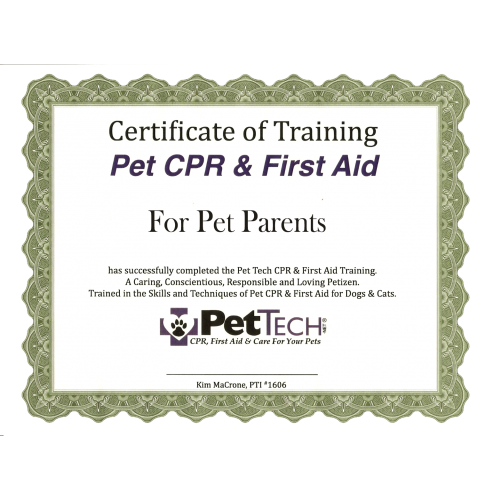 "Pet Tech ICCE Bandana (22 x 22 inches) a place to write your pet’s In Case of Canine Emergency information including vitals (heart rate, breathing rate, temperature and special considerations. Additional shipping applies for International orders."